Enjoy a Friday notes column with a focus on the Final Four. Golden Gophers forward Jordan Murphy, still cautious after injuring his back two weeks ago in Minnesota’s NCAA Tournament win over Louisville, said he may not play in the Reese’s College All-Star game scheduled this afternoon (Friday) at U.S. Bank Stadium as part of the Minneapolis Final Four activities. Murphy, though, plans to participate in the Dos Equis 3-on-3 tournament starting today at Mall of America. The three-day tournament consists of college seniors like Murphy who are grouped with other players from their conferences, and they compete for $150,000 in prize pool money, with $100,000 going to the winning team. Murphy had never missed a Gophers game until his back problem of two weeks ago forced him to sit out Minnesota’s second NCAA Tournament game against Michigan State. He never had previous back problems but he suffered spasms and soreness when the Gophers were in Des Moines for the tournament. Trying to get ready for Michigan State, Murphy said he saw a chiropractor twice, took ice baths and also used heat, and did some stretching and jogging. “There’s probably zero chance I could have played in that game,” Murphy said. Internet reports and a Sports Headliners source believe the University of Arkansas has interest in the Gophers’ Richard Pitino for its head basketball coach opening. Inner city youth received a lesson yesterday as to why sports—even when played at the highest levels—is about more than wins and losses. Youngsters at a Minneapolis Convention Center event took home about 1,000 items including sports apparel donated by the Clean Out For A Cause program supported by coaches, athletes, and staff from college and professional teams throughout the country. 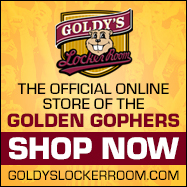 The program launched in 2013 when basketball coach Tubby Smith donated excess Gophers items after he was let go by the University of Minnesota. The 100 pound donation has since turned into over 200,000 pounds of sports gear donated by over 100 college programs, and nearly half of all pro sports teams as they pass on used or excess shoes and other items each season. Drew Boe, a former Gopher student manager under Smith, has been the driving force of the Clean Out For A Cause program and the generosity it provides. More on Boe at the Managers On A Mission website. Boe admires Smith who was joined by other sports celebrities at the Convention Center to deliver messages about life. Smith has long been known for his commitment to help in places where he has coached including in Minneapolis. Smith’s predecessor as Gophers coach, Dan Monson, is also in town for the Final Four. Smith had a 16-15 overall record as head coach at High Point last season. Monson was 15-19 at Long Beach State. 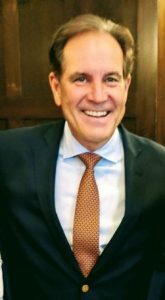 Jim Nantz, who has spent his entire national broadcasting career at CBS television, works his 30th Final Four in Minneapolis this weekend as the network’s play-by-play voice. Nantz is doing his third Final Four in Minneapolis. David Ching, writing Tuesday for Forbes.com, said all four coaches in the Minneapolis Final Four will be receiving bonuses for the NCAA Tournament runs of their teams and can add a lot more by winning the national championship on Monday night. None can profit more than Virginia’s Tony Bennett who with the Cavaliers’ tournament march to Minneapolis has already earned $850,000 in incentive bonuses. A national title will add $400,000 more to the payday. How difficult is it to predict before the season the teams that will be in the Final Four? Very challenging even for the best crystal ballers. The entrants in Minneapolis this weekend are Auburn, Michigan State, Texas Tech and Virginia. Prior to the season Athlon’s college basketball magazine had Duke, Gonzaga, Kansas and Kentucky in the Final Four. Nice try with Duke, Gonzaga and Kentucky all losing in Elite Eight games. Michigan State will try to win the Big Ten Conference’s first men’s NCAA Tournament basketball championship since 2000 when coach Tom Izzo’s Spartans won it all. The league is frequently promoted as a great hoops league but all time the Big Ten has won only 11 titles in the tournament that started in 1939. Per Wikipedia, UCLA alone has 11 national crowns. Kentucky has eight, and ACC powers North Carolina (six) and Duke (five) have 11 titles. Indiana with five titles and Michigan State with two, are the only Big Ten programs to have won multiple NCAA men’s basketball championships. Minnesota, of course, has no national titles and has a combined 9-11 record in the NCAA Tournament not counting vacated games due to NCAA violations. No doubt the absence of Duke and its must-see freshman Zion Williamson put a damper on ticket prices for Minneapolis Final Four tickets. The average resale ticket price for games Saturday and Monday won’t come close to the $900 reported by geekseat.com for the 2015 Final Four involving showcase programs Duke, Kentucky, Michigan State and Wisconsin. Game tickets aren’t the only hot commodities in Minneapolis. Reservations at the city’s top restaurants are popular, too, including at Murray’s where the iconic steak house (in business since 1946) is sold out on Friday and Sunday nights. 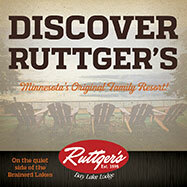 Earlier this week owner Tim Murray said Saturday and Monday will be busy, too. Word is Duke freshman point guard Tre Jones from Apple Valley could be a first round pick if he decides to leave college early for the NBA. Former DeLaSalle and Kentucky standout Reid Travis, who projects as a power forward in pro basketball, isn’t likely to be drafted in either the first or second round by an NBA team, per a pro scout. Former Timberwolves player and front office executive Fred Hoiberg, now the new Nebraska head coach, is assembling his staff including Matt Abdelmassih who he referred to at his introductory press conference this week being “as good as” any recruiter in the country. Abdelmassih, who was a student manager for St. John’s from 2004-2007, met Hoiberg after college when he was an intern for the Timberwolves. Abdelmassih, described by ESPN authorities as the best transfer recruiter in the country, left his position as an assistant coach at his alma mater to join Hoiberg in Lincoln.